In your December holiday box this week we included lots of goodies including a few that were used in this recipe. 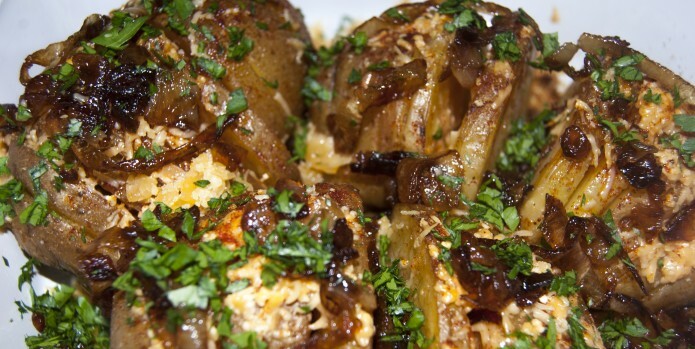 (Yellow chieftain potatoes, Shallots and Italian parsley). Here’s a little something different than your run-of-mill baked spud – we caramelized the shallots and added some smokey flavor profiles to please your palate. I like baked potatoes. I don’t have a microwave oven, and it takes forever to bake a potato in a conventional oven. Sometimes I’ll just throw one in there, even if I don’t want one, because by the time it’s done, who knows? I suppose this recipe wasn’t what comedian Mitch Hedberg was intending on making when he ranted about the cooking time of everyone’s beloved baked potatoes. Hopefully he would approve. Enjoy! Preheat oven to 375 degrees. 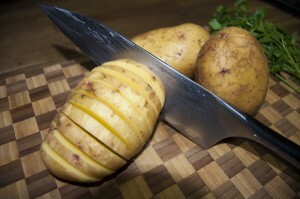 Make deep cuts into each potato, around 1/4 inch apart without cutting through the entire spud. Lightly rub each potato with olive oil and salt. Sprinkle the smoked paprika throughout the inside of your cuts. 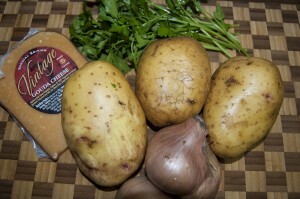 Arrange potatoes, cut sides down, in a small baking dish. While you’re waiting for these darn things to cook, now is the time to start on your shallots. Gently peel and slice these tear-jerkers to around 1/4 thick. You should have around 1 cup worth of shallots when you’re done. In a small saute pan, add 1 Tbsp of olive oil and begin to heat on a low/medium setting and add your shallots and the teaspoon of butter. The goal is to cook these puppies slow and low so if you think your stove is a little too hot, your best bet is to turn it down to avoid burning your shallots. Continue to cook on low for around 20 to 30 minutes until they are golden brown and begin sticking to your pan a little. At this stage, add the 1/2 teaspoon of sugar to aid in the caramelization process. Once your shallots really begin to look golden and delicious, add a tablespoon or two of white wine and deglaze those suckers. Yummmmmmmy. 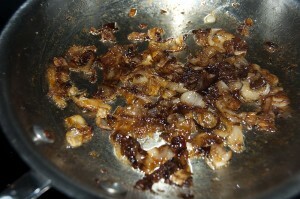 If you’re shallots finish prior to the stage of flipping your potatoes, just remove them from the heat and set aside. We’ll get back to those later. After your potatoes have been cooking around 40 minutes (or when they are close to being done) remove them from the oven and over. Begin adding your aged gouda between all of those little cuts you made in the potatoes. Reserve around 1/4 cup of cheese for later. Put your spuds back into the oven for another 15 to 20 minutes until they’re done. Remove from oven and top with the leftover cheese, caramelized shallots and freshly chopped parsley. Bon Appétit! This hearty side dish makes a sweet and savory alternative to the more traditional Thanksgiving turkey accompaniments. 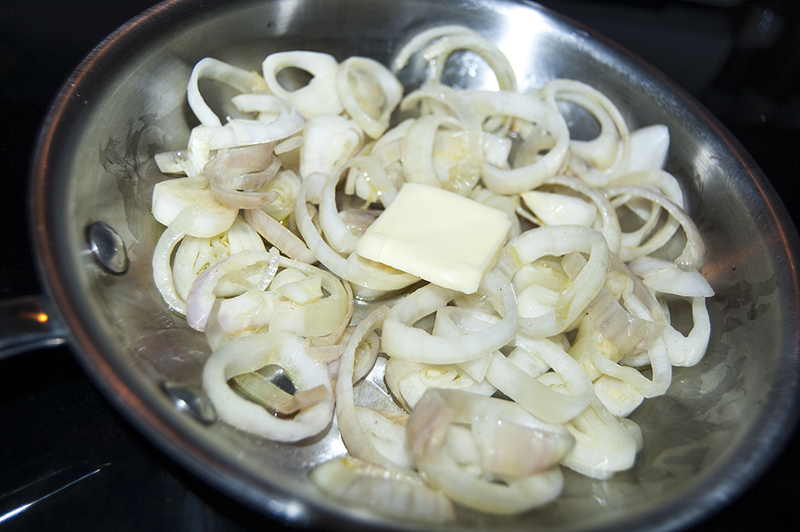 In a medium pan, saute garlic and onion in olive oil until tender. Add shredded kale and continue to cook until wilted. Stir in thyme leaves, salt and pepper. Arrange carrot medallions in a greased 2-quart casserole dish. 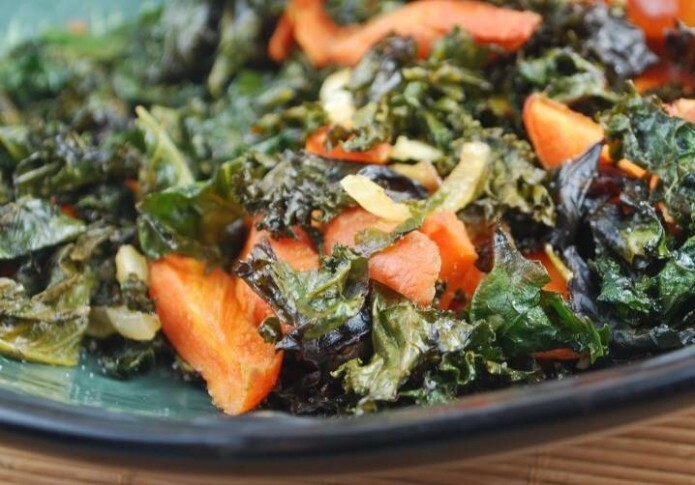 Cover with sauteed onions, garlic and kale mixture. Cover and bake at 350 degrees for about 45 minutes, or until carrots are softened. Heat the pine nuts in a dry skillet, over medium heat, until they begin to brown. Watch them carefully, as they will burn in a flash. Remove from the heat & transfer to a bowl. Set aside. Peel the beets & slice them into bite-sized pieces. Remove the stems from the beet greens & slice the leaves into strips. Wash the greens thoroughly to remove any grit. Heat the olive oil in a skillet over medium heat. Add the sliced red onion & garlic. 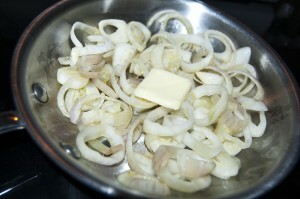 Cook until the onions are tender & golden brown, about 10 minutes. Reduce the heat to medium low & add the beet greens. Cover & cook, tossing occasionally, until the greens are wilted, about 5 minutes. Meanwhile, cook the beets in a pot of salted water, until just tender, about 10-12 minutes. Remove the beets from the pot using a slotted spoon & set aside. Return the water to a boil & add the pasta. Cook, according to the package instructions, until al dente & drain. Add the orzo to a bowl, along with the beets, pine nuts, beet greens & crumbled feta. Toss, season with salt & pepper to taste & serve.